Eventually I replaced that by buying a copy of the excellent abstract Pylos (which is also a game played with spheres on a 4×4 grid). 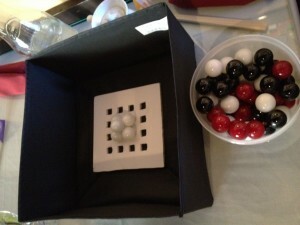 My marbles work great on the Pylos gameboard, so I’ve basically just scrapped my original posterboard now. 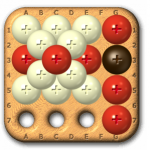 My first game for Shibumi was called Spice, (all games need to start with “sp”, standing for “square pyramidal”). It was actually just a port of Nick Bentley’s interesting abstract Ketchup. So I guess there really wasn’t much design there. I spent quite a few weeks thinking (obsessing) about Shibumi, and one of my other ideas was to remove “tetris shapes” from the gameboard after you (or your opponent) make them. I called it Spolyominos, mostly just because someone had already called their game Spetris earlier in the competition. 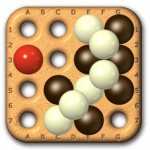 The goal with this was wanting to create gameplay that “feels like” the great chess variant Tic-Tac-Check, (which plays super fast and is a lot of fun), but in that game, players have pieces of their own color, (and they’re trying to connect 4 of them on the gameboard). I didn’t really figure out a way to have the three colors correspond to the three types of chess pieces, and also have pieces that are either one player’s or the other’s. Partly as a result of my Shibumi game design obsession, I’ve been thinking a lot lately about modern abstract game design. And as a result, I really wanted to play more modern abstracts. I decided to set up a board game meetup to play some of the abstract games I own, but hadn’t gotten a chance to play, and it went really well! We played a ton of Shibumi games, as well as many of the GIPF project games that I rarely get a chance to put on the table. I also got to play Ketchup for the first time (not on a website). The next minneapolis abstract strategy game day is scheduled for a week from today, and I’m hoping it’ll be equally entertaining. 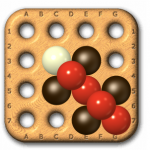 This entry was posted in Board Games by Martin. Bookmark the permalink. i’m very interesting to know how to play Shibumi, do we have that software download pc? or can be able to buy Shibumi game set board? where do i get it from? i come from United kingdom!